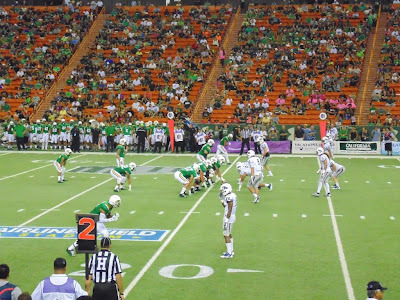 I got to take in the University of Hawaii football game against the University of Nevada. It was homecoming night and the UH was in their throwback green rainbows uniform. It looked like magic was happening in the first half when the Warriors we consistently moving the ball and at one point were out in front 10-0. However the second half was all Nevada as they beat Hawaii 26-18. Special thanks to Bank of Hawaii and Mcdonalds Hawaii for my ticket. Every once in awhile I make it back to my alma mater Moanalua High School for the Homecoming football game. When I was in school I used to always think it was meant for the football game but now I understand its the game to welcome alumni back. Here is the Moanalua Menehune football time singing the schools alma mater just prior to the start of the game. The photo is not as clear as I hope since I was in the stands and the stadium lighting wreaked havoc on the camera’s focus ability. I’m happy to say on this night Moanalua prevailed 42-30 over a feisty Aiea football team. 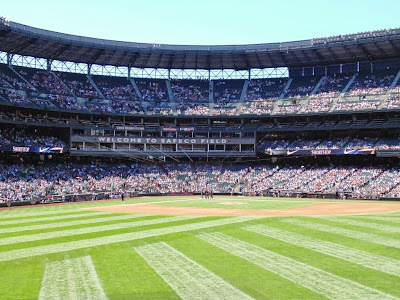 Took in a Seattle Mariner’s game against Baltimore on my visit. First time at Safeco field which was very nice though the Mariners lost the game. I was thrilled to be at my nieces first baseball game. I have to time one of my visits during football season and see if I can make it to a Seahawks game. Its very interesting the baseball and football fields are right next to each other.